to spring.. While in Key West this winter we entertained a lot and we were entertained. It’s a social town and it’s fun to be able to eat outdoors. Even in the summer in Nantucket it is hardly ever warm enough to have dinner outside. Entertaining begins with a beautifully set table. I love setting the table almost more than anything else having to do with having guests for a meal. How you set a table sets the mood. You might pick a color scheme, a season, a holiday, or a special occasion. Or, you might just be in the mood. Setting a table is a most satisfying creative endeavor. A beautifully set table, no matter how simple, makes guests feel special. Everyone appreciates it when the hostess makes an occasion out of an invitation. It doesn’t have to be fancy, but when you arrive at someone’s home it should immediately feel festive. My friends have a knack for making even a casual meal, served in the kitchen, seem like a special event. Best of all we do it with ease and creativity with readily available and affordable “props.” This is the key to entertaining – setting a pretty table without pretension and without making the guests uncomfortable. So, the other night I had 7 friends for dinner on the deck beside the pool. 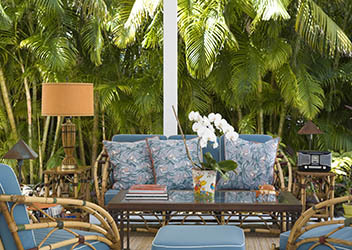 This is Key West so I set the table with palm fronds. Here’s the step by steps: first cover a table with a tablecloth. 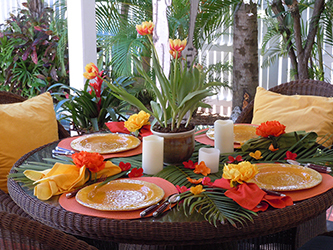 Then spread large leaves, I used the palm leaves, over the table. This is easy to do in Nantucket with large leafy spinach or kale. Put one leaf under each plate. I used yellow plates and sprinkled artificial flower petals over the leaves. I alternated yellow, orange and green napkins and floral napkin rings. I love napkin rings because they quickly, easily and inexpensively dress up a table. Just like putting on earrings! For the centerpiece I used yellow and orange tulips. But on another occasion I used a lush white orchid in a handmade pottery vase, a gift from a friend. Into the centerpiece I stick twigs that are wired with tiny battery operated LED lights. And lots of candles! Nothing camouflages imperfections like candles. It’s like airbrushing everyone and everything! As the sun goes down and dusk closes in, the glow from the lighting changes the mood. On Nantucket it gets dark earlier than in Key West so it is still light here late into the evening. The first daffodils are always the sweetest because they come after a very long winter. I love a bunch of them in simple Mason jars. Yellow is a very popular home furnishing color this season. It makes a very strong statement when you add a few bright yellow throw pillows to your living room.